My friends Menaga, Lopa, Kiran, Love2cook and Krishnaveni passed me the following awards. Sorry girls for posting the awards very late. Thank you so much for your love. Yummy Team passed me "Tag" Award and as per the rule I've to post a favourite picture. I've been tagged already with this award and my favourite picture is here. 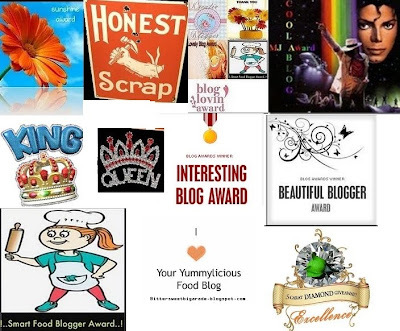 I'm passing on all these awards to all my blogger friends. Please all of you accept these awards and post them in your blog. congrats on ur awards dear!! Congrats Nithu on your awards, I wish you many more success and awards in the world of blogging. Nithu, congratulations for all the wonderful awards :). Happy blogging !!!! Congrats for your awards. I am sure that there are more such awards to come. Congrats on all the wonderful awards.Wishing you many more to come. Congrats on ur award Nithu! Deserved well! Congrats on you awards nithu !!! Congrats dear on ur luvly awards..keep rocking..!! !